Once again, Manny Pacquiao reign supreme in the boxing arena. No doubt Pacquiao is the best fighter in boxing, pound-for-pound. He is one of those rare performers who is able to challenge bigger opponents and still dominate. He defeated Ricky Hatton by 2nd-round techinical knock-out. Pacquaio's speed is undeniably awesome. 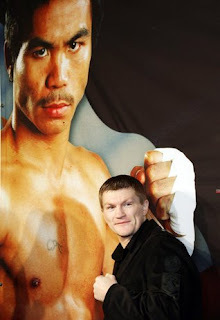 Hatton was down twice in the 1st-round, and he fell again in the 2nd-round that gave the decision to Pacquiao. It was a good fight. Hatton is good, not great. Pacquiao is an all-time great who is a sure-shot for the Hall of Fame. He probably is the greatest Asian fighter in boxing history. Congratulations Manny Pacquaio. You gave honor again to your beloved country.